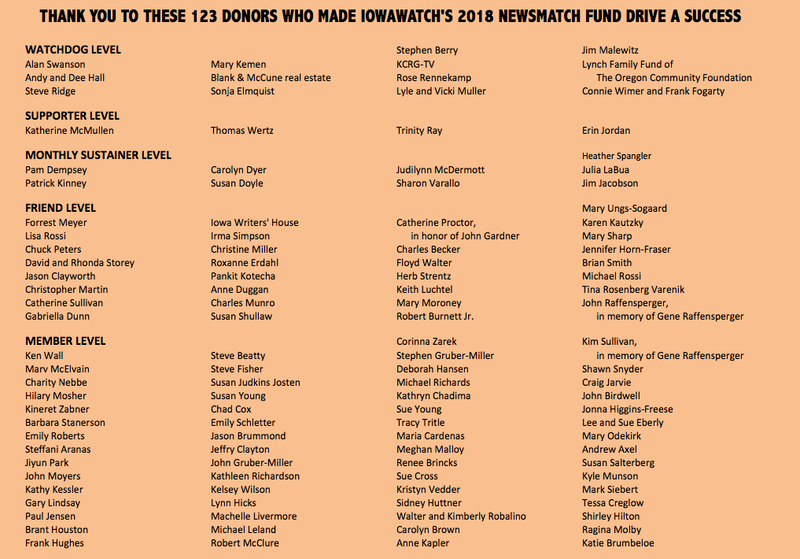 Thanks to 123 generous donors The Iowa Center for Public Affairs Journalism, which runs the IowaWatch.org news effort, raised $29,023 in its end-of-the-year NewsMatch fund drive. Of that, $22,155 was eligible for matching funds from the national NewsMatch fund drive. The numbers for donors and donations were updated on Jan. 5 after two final checks sent in the mail in time for the NewsMatch deadline of Dec. 31 arrived and were counted for the final figures to he turned in for matching fund from the national NewsMatch fund drive. The totals far exceed the $21,214 raised — $19,021 eligible for matching funds — during IowaWatch’s 2017 NewsMatch fund drive. The John S. and James L. Knight Foundation, Democracy Fund, John D. and Catherine T. MacArthur Foundation, Ethics and Excellence in Journalism Foundation and Facebook, plus other donors, provided funds for the NewsMatch drive for Institute for Nonprofit News members. IowaWatch is a member of the Institute for Nonprofit News, a consortium of nonprofit news organizations that provided fundraising training and technical support for this fund drive. IowaWatch will use funds collected in this drive to support news reporting. The NewsMatch guidelines called for matching up to $1,000 for each individual or business donation to IowaWatch from Nov. 1-Dec. 31, 2018. IowaWatch has been eligible for NewsMatch funding from the start of this national fundraising effort to support nonprofit journalism in late 2016 and early 2017. IowaWatch raised $15,030, of which $9,530 was eligible for a match from the Knight Foundation in that first NewsMatch fund drive. 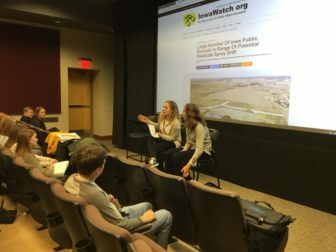 Cedar Falls High School students Sabine Martin (l) and Sophia Schillinger tell fellow high school journalists at an Iowa High School Press Association conference how they did an investigative report in spring 2018 with IowaWatch. The conference was in Iowa City, Iowa, on Oct. 25, 2018. 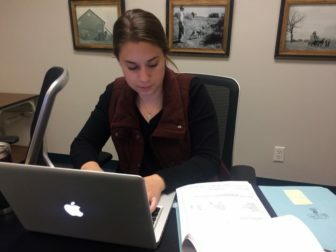 The Iowa Center for Public Affairs Journalism produces investigative and community affairs journalism in collaboration with other news organizations and works with college student journalists to produce in-depth news stories at a high, ethical level. Its plans for 2019 include increasing its focus on public health investigative news. IowaWatch collaborates with several news organizations and is the Iowa media partner for the nonprofit Hechinger Report. Its 83 news stories were republished or aired 1,314 times via 77 news outlets in 2018. To learn more about The Iowa Center for Public Affairs Journalism’s supporters go to this link. The center is an independent, 501(c)(3) non-profit and non-partisan journalistic program dedicated to producing high quality investigative journalism while training journalism students on this work at a high, ethical level.